Battery Capacity 1)13200mAh battery: 4.5AH; equivalent to 12V 4800mAh. 2)19800mAh battery: 7AH; equivalent to 12V 7200mAh. Working Time 1) 13200mAh battery: more than 40 hours with 1*3W LED Bulb on, more than 20 hours with 2*3W LED Bulb on.2) 19800mAh battery: more than 60 hours with 1*3W LED bulb on, more than 30 hours with 2*3W LED Bulb on. 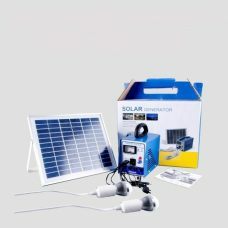 - The Solar Power Generator System has portable design, easy to set up and maintenance. - USB Interface 5V output Smartphone, Mobile Phone, Camera can be charged. 1. The Solar Power System made for charging by sunlight and cannot be charged with other DC power supply. 2. The Host machine and LED bulbs are not waterproof so do not throw them into water. 3. The LED bulbs suite only use for this Solar System. 4. When charging the System under the sun, the Solar Panel should be placed at an angle of 30°~45°. 5. We recommend to charge power bank first and only then charge mobile phone from the power bank.